Windsor was a quick stop before heading back into London, mainly to have a look at Windsor Castle. 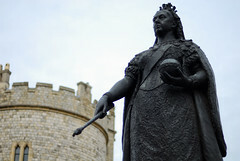 Situated on the Thames, Windsor is a pretty town and a favourite with the tourists. We wandered through Windsor’s busy streets and checked out some of the tourist shops followed by ice cream by the river. I like this photo, Victoria is quite imposing and I dare say I shall practice this pose and glare. If only I had the castle to go with it!